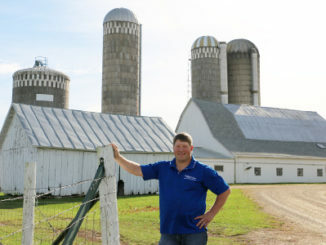 Von Ruden reiterated Wisconsin Farmers Union’s longstanding call for a federal policy mechanism to balance supply and demand in the dairy industry. “Wisconsin dairy farmers are losing money each time they walk into the barn, because the flood of milk on the market has driven the price lower than what it costs to produce it. No government bailout or new trade deal is going to solve that problem. We need a federal framework for bringing milk production in line with demand, and the longer the federal government puts off doing this, the more equity our farms will lose,” said Von Ruden. Agricultural Financial Advisor (AGFA) data from 2017 showed that the average farm lost $1.04 per hundredweight of milk produced. The USMCA trade deal may provide some additional market for U.S dairy products, but without supply management there is no guarantee that prices will come up to reduce the losses farmers are facing every day. Averaging the values for 2016 and 2017 yields $36,409,165,000. $560,000,000 divided by $36,409,165,000 equals 0.01538, or approximately 1.5%. In actuality, this figure probably over-states the value of the new Canadian market access relative to the value of U.S. dairy production. The statistic used as the denominator above is “total value of U.S. Milk Production,” which measures farmgate prices. The total value of U.S. finished dairy products is likely several times higher than the farmgate price. If the total value of finished dairy products were used as the denominator, the 1.5% figure would be even lower. Unfortunately, USDA does not publish the total value of U.S. finished dairy products.